Exclusive to Harvey Norman or from HP's online store. 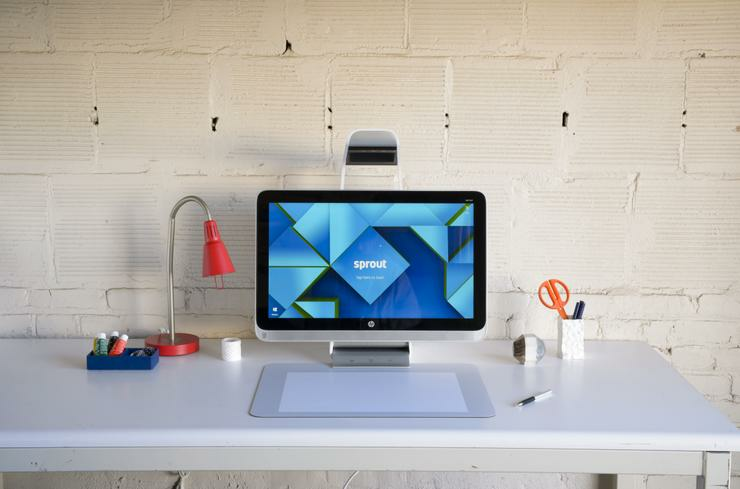 Sporting the now-traditional form factor of an monitor-based all-in-one, but with a 3D scanner jutting out at 45 degrees from the top, the Sprout is HP’s high end play at an immersive and tactile user experience. Tellingly, none of the corporate images HP furnishes of the Sprout include a keyboard. Customers have the option of placing objects on a flat mat for scanning or using the separately-sold 3D Stage Capture podium, which can turn objects and tilt them up to 15 degrees, the Sprout is the confluence of 3D scanning and desktop computing and is primarily aimed at creative professionals working in the design and engineering industries. There are also applications for artists, photographers, musicians, animators, scrapbookers and gamers. To gain an idea of the premium nature of this product, consider the pricing: $3,999 for the PC and a further $599 for the 3D Stage Capture accessory. This includes a 1-year warranty and “a white glove set up service”, which is a fancy way of describing home/office delivery and installation. The Sprout by HP has in Intel Core i7 processor with Intel HD Graphics 4600. There is 8GB of RAM, which is upgradable to 16GB, and a 1TB SATA solid state drive (5,400rpm). It ships with Windows 10 Home 64. There’s a range of HP and third party applications available to get the most out of this hardware, from the family friendly inspired fun of Crayola Color Alive and Origami Apprentice, to the more professionally envisaged Mischief for Sprout, for creative sketching and drawing; Light Stencil, for tracing and etching; and Video Capture, for multiple camera recording from the Sprout accessory. These apps are available from HP’s dedicated Sprout marketplace, which HP promises will bulge due to the high demand of its software development kit. HP has signed an exclusive distribution deal with retail giant Harvey Norman, meaning this model is only available from that dealer, and only from 17 of its outlets, as well as from HP’s online store. Suppliers are more and more pursuing these one-to-one wholesaler strategies for a variety of reasons. First and foremost, it inures HP against store-to-store competition, meaning customers have less haggling potential with staff. Suppliers and retailers also list streamlining logistics and simplifying the staff training required of complex product categories for sales staff as reasons. The Sprout will be available from 5 October 2015. Harvey Norman stores set to stock the Sprout include Newcastle, Fyshwick, Auburn, Moore Park, Caringbah, Alexandria, Bundall, Aspley, Oxley, Chadstone, Nunawading, Gepps Cross, Osborne Park, Cannington, Springvale, Queen Victoria Village and Bondi. For those that care about international price discrepancies, HP is currently selling the Sprout for $US1,899 and the 3D Stage Capture Accessory for $US299 on its US online store. That’s a combined $US2,198, translating to $3,039 on today’s exchange rate, compared to $4,598 for the set at Harvey Norman.